Components can be added to an in-page experience allowing you to customize and brand the experience. To add components to an in-page experience, edit the experience and then click LAYOUT in the left navigation. 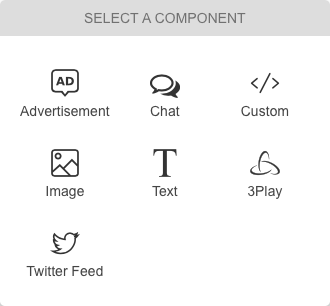 Click the plus icon ( ) where you want to add a component and then select the type of component to add. Note: After making any changes to an experience, make sure you republish the experience so the changes appear on sites that display the experience. Click Advertisement on the component picker. Enter a Name for the advertisement. Enter the Header Ad Code and Ad Unit Code. 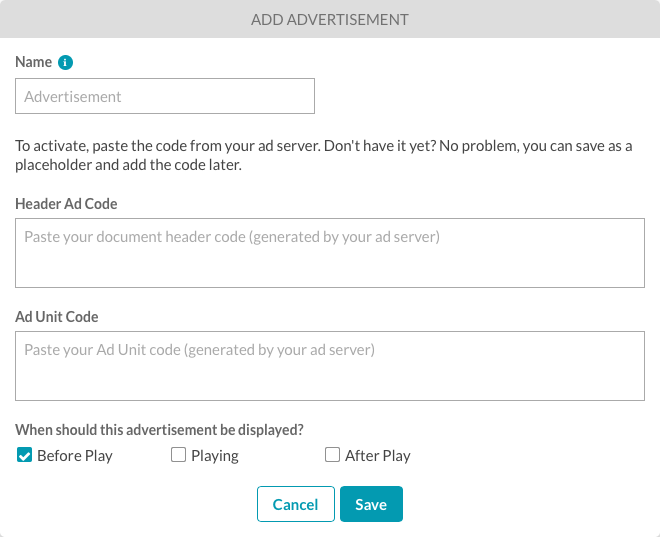 Header Ad Code will be shared across all advertisements in the experience. Select when the advertisement should be displayed. Click Save. The advertisement will appear on the experience. Note: If you have an in-page experience with multiple ads, ensure that each Ad Unit Code has a unique div id. You may need to edit the id of the div and the container parameter of adblock1 to match that id. Click Chat on the component picker. Enter a Name for the chat component. Enter the chat HTML code. 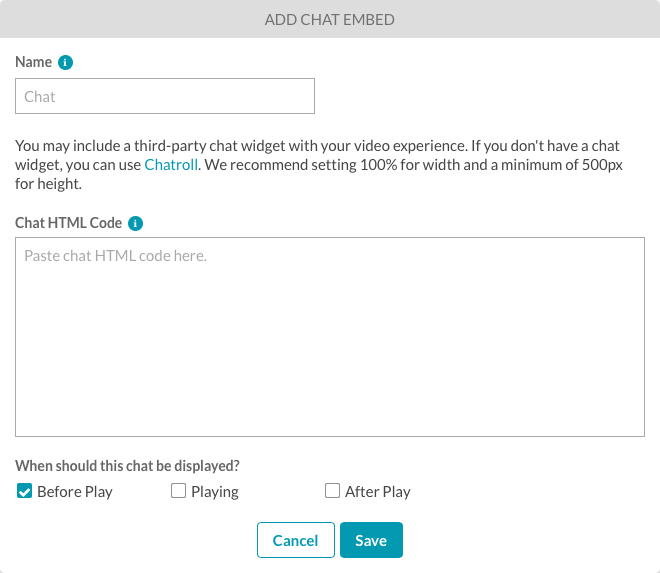 Select when the chat should be displayed. Click Save. The chat will be rendered on the experience. Custom components can be used to add your own custom HTML to an experience. For example, if you have created a custom lead form using a marketing automation platform (MAP), the lead form HTML from the MAP can be added to an in-page experience using the Custom HTML component. Click Custom on the component picker. Enter a Name for the HTML component. Enter the custom HTML to add to the experience. Select when the HTML should be displayed. Click Save. The HTML will be rendered on the experience. If no HTML is entered, an HTML placeholder will be displayed. Click Image on the component picker. 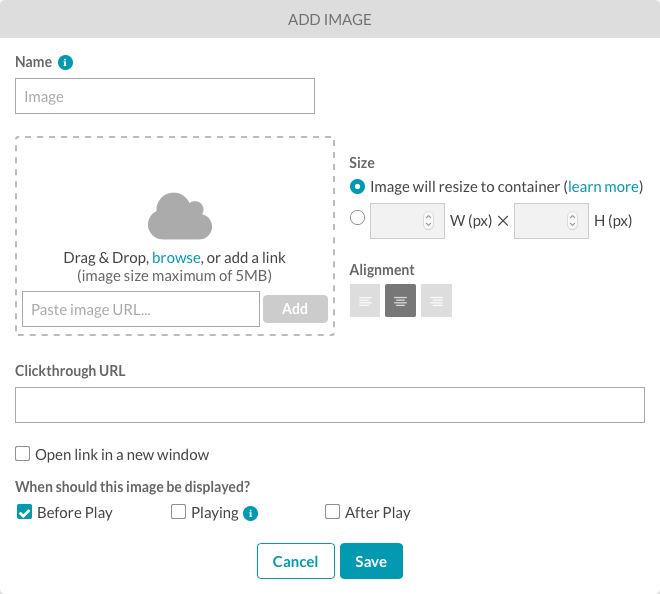 Image will resize to container - Images that are larger in size than the container they are in will be scaled down to fit. Smaller images will not be upscaled. Enter a Clickthrough URL. This is the URL to go to when the image is clicked. You can also Open link in a new window. Select when the image should be displayed. If no image is selected, an image placeholder will be displayed. Click Text on the component picker. Enter a Name for the text. Select when the text should be displayed. Click Save to add the text. The text will appear on the experience. If no text is entered, a text placeholder will be displayed. 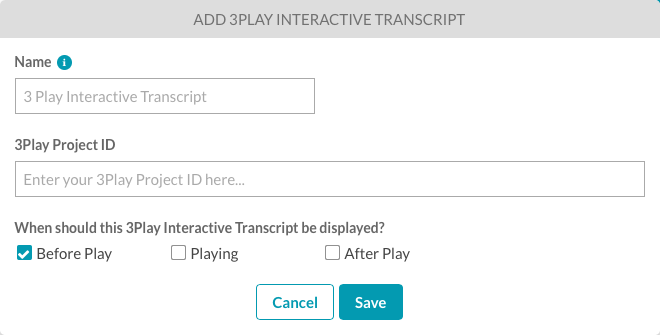 3Play components can be used to add a 3Play interactive transcript to an experience. 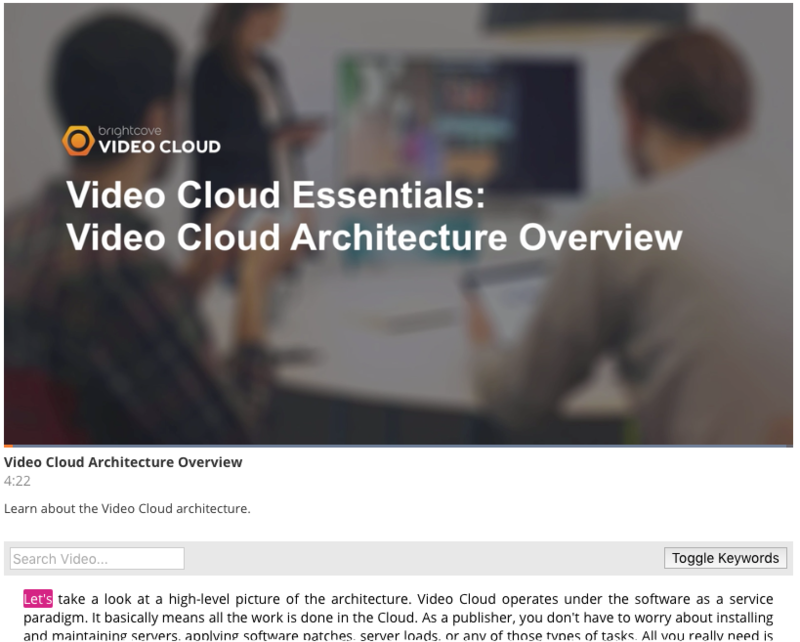 This component will only work if your video captions were generated by 3Play Media. When this component is added to an experience, a Show Interactive Transcript link will appear. When clicked, the video transcript will appear. In the following example, a 3Play component was added below the video player and was configured to appear during the Playing state. For a live example, see this link and play a video. 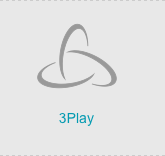 Note: To have the 3Play component enabled for your account, contact your account manager or Brightcove Support. Click 3Play on the component picker. Enter a Name for the 3Play component. Enter your 3Play Project ID. To find your 3Play Project ID, login to your 3Play account and click the Account Overview link in the page header. The Project ID will appear on that page. Select when the 3Play component should be displayed. Click Save to add the 3Play component. The 3Play component will appear on the experience. Click Twitter Feed on the component picker. Enter a Name for the Twitter Feed. Select when the Twitter Feed should be displayed. 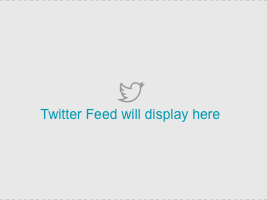 Click Save to add the Twitter feed. The Twitter feed will appear on the experience.